For wizarding student Harry Potter, the exurban London residence of George and Petunia Dursley is merely a house. But the ramshackle countryside tower of the Weasley clan is much more than that. “It may not look like much,” says Ron, somewhat embarrassed of his family’s low status, “but it’s home.” To Harry Potter, it’s a wonderful place of camaraderie and commonplace magic, which gradually becomes more of a home to him than any place save Hogwart’s. 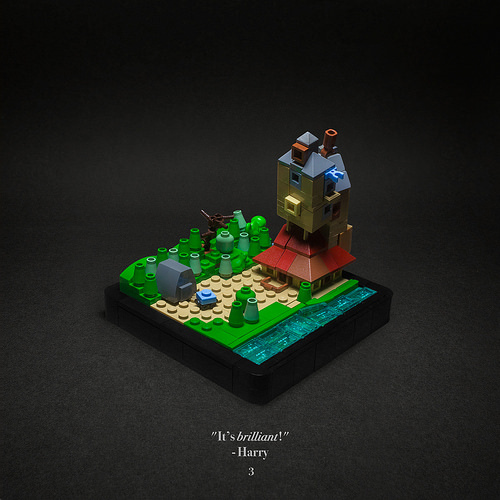 This microscale model of the Weasley home (affectionately called the Burrow) by Markus Rollbühler is also pretty wonderful. His vignette is chock full of texture and details, right down to the light blue flying Ford Anglia parked in the drive. Brilliant!